Soft Bib. Has an adjustable neckband for a perfect fit. The deep spill pocket is curved and makes the bib very easy to clean. Baby Plate. 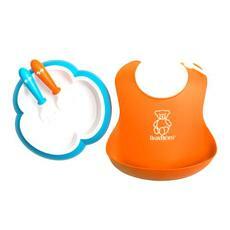 The plate’s shape and edges make it easy for your child to scoop up food against the edge. The shape of the rim makes it difficult for your child to grab hold of the plate or tip it over. The rubber edging underneath prevents the plate from sliding about on the table. Baby Spoon and Fork. The short handle is easy for a small hand to grip and it has a lower ring that prevents your child’s hand sliding too far down the spoon/fork. A groove on the back of the handle prevents the spoon/fork from sliding down in the plate. Materials: The bib is made from polypropylene (PP) and thermoplastic elastomer (TPE). The spoon, fork and edges of the plate are made from polypropylene (PP) and the rubber ring on the base of the plate is made from thermoplastic elastomer (TPE). The plate consists of two parts and has a removable inner plate. The inner plate is made from acrylonitrile butadiene styrene (ABS). Country of manufacture: Sweden. Product Care: The bib, plate, spoon and fork are easy to clean and dishwasher-safe. The plate can be used in a microwave oven at low heat, max. 90°C. Do not allow the food to cook on the plate. Bought for my granddaughter to use at my place. Bib works well and stays done up unlike some similar type bibs I have tried. The plate is great as it stays put and the shape makes it easier for her to scoop up her food.